At the top of a long, twisting gravel road climb, we stop to snap a few pictures of the Alpine valley scene unfolding below us. 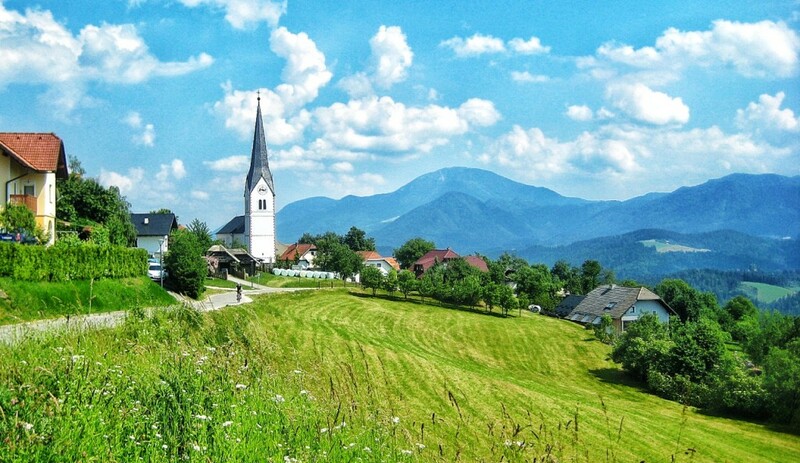 Only about 25km from our camp in Austria at Pirkdorfer See, but a 2-hour grind on unpaved mountian roads, we are almost to our destination, Ekohotel Kmetija Koroš – a hilltop mountain bike enclave and the nerve center of bicycle tourism in Slovenia. As we mount our rides and continue up the hill a van approaches quickly from below. Slowing to pass, a voice calls out, “You’re almost there…” Looking up from the steel-eyed gaze that I have affixed to the road in front of me, I see the smiling face behind the wheel. “I’m Dixi, and you’re almost there…” he calls again. 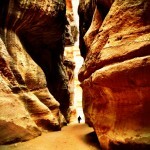 Thank God, I think… not sure how much more of this climb I can take. Carolyn, only about 100m behind me is as always, plowing forth in earnest and never looks as if she is stressed. I, on the other hand, am at my red line. It could be partly that I’m carrying twice the load she has, or perhaps it’s the extra 8kg around my waist. Either way, I’m glad to see Dixi, and to know we’re almost there. 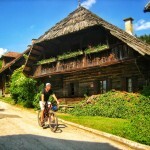 Dusan “Dixi” Strucl is sort of a legend in the Slovenian Bicycle Tourism circles. 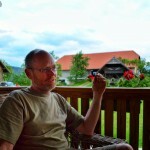 Almost 20 years ago, he began organizing mountain bike tours out of a rented hotel space in Črna, Slovenia. By his own recollection, most people thought he was crazy. 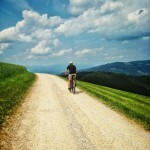 Afterall, who would come here, the hinterlands of the Europe, to go mountain biking? Once you get to know Dixi, you soon discover telling him he’s crazy only pushes him further to pursue his goals. 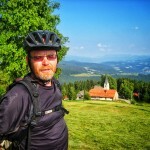 Since then, he has slowly but steadily grown his business to become THE destination location for mountain biking, and positioned himself to be the leading national authority on bike tourism in Slovenia. He has been instrumental in the development of the nation’s bike friendly hotel rating system (not so coincidentally his hotel rates 5 of 5 wheels), and worked tirelessly developing bike route maps, marking trails & roadways and pushing the outward voice of the Slovenian Tourism Board’s “Cycling Slovenia” booklet that first caught our attention almost 2 years ago. 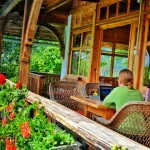 The current location, in Jamnica, the hilltop enclave to which aspire, has housed his operation for the past six years. 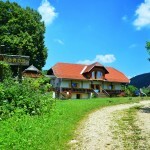 An old farm complex complete with expansive views and several quaint farm houses is home to Ekohotel Kmetija Koroš. 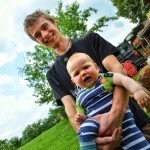 From here, Dixi and his family not only maintain a working organic farm, but also organize mountain bike tours around the immediate area and all across Slovenia. 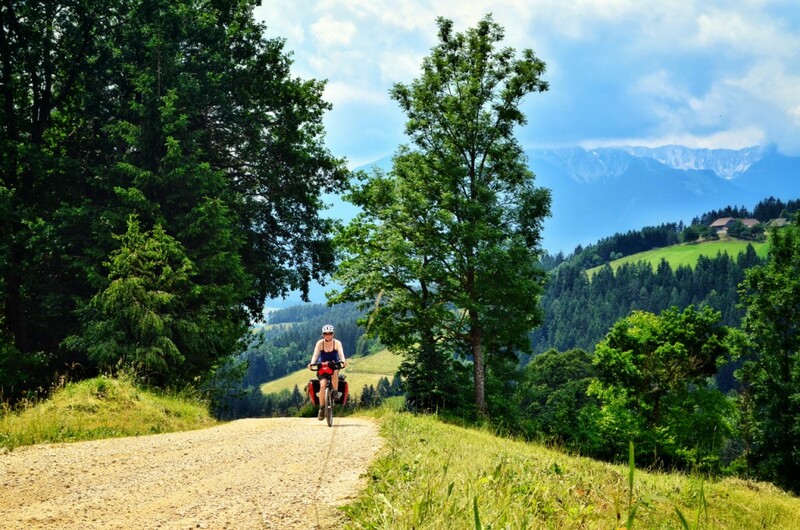 Locally, they have an almost endless spiderweb of gravel and unpaved forest roads weaving across the undulating landscape from village to village and farmhouse to farmhouse all connected with jaw-dropping singletrack. In further reaches of this tiny mountainous land, they utilize local guide’s expertise to lead their guests in and out of the mountain trails and forest roadways connecting them, with Dixi’s team playing the role of logistics managers. 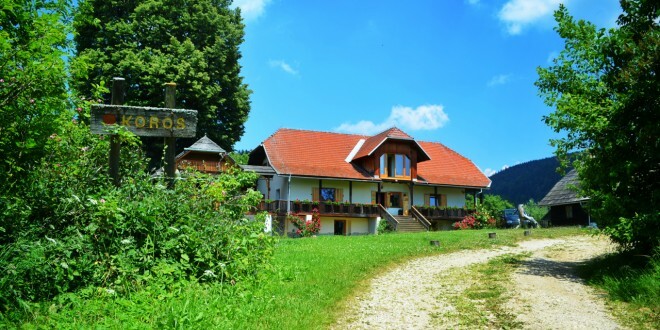 As we arrive at Kmetija Koroš (Slovenian for “the Koroš Farm”), we are greeted by the entire Strucl family at once, a scene that we will see play out several times during our stay. It feels more like a homecoming than checking into a hotel. As soon as we enter the main house, Anej, Dixi’s son, greets us with a small glasses of the “local tap water”. 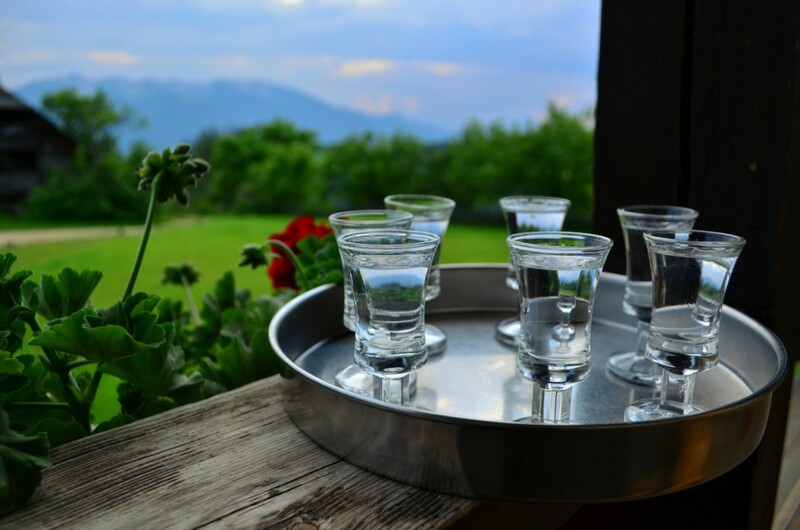 Rakia, a moonshine made from Pears or other tree fruits, is offered to guests the second they enter the home. 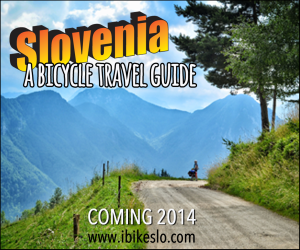 It’s a Slovenian tradition and we would be rude to refuse. Plus, as Anej points out, it prevents colds and flu….yeah, right. Rakia consumed and pleasantries exchanged, we settle into our comfortable room in the main farmhouse along with the other guests from around the world. Israeli, British, and German bike tourists make up the current mix. As new guests arrive, they’re greeted in the same warm way, and as they depart it seems more like the tearful end of a family reunion (OK, not my family, but I’m sure someone’s…) than guests leaving a hotel. Anej explains that they treat all their guests so warmly because that is how Slovenians see guests, as family. The hotel is complete with several comfortable common rooms, bike garage, repair station, rental bikes and extra gear, if needed. 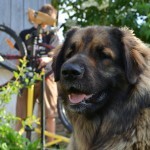 The grounds are guarded by Luna, a gentle giant of a dog and several personable farm cats who seem to share the congenial spirit exuded by Dixi and his family. There are no spa treatments, facials, fluffy bathrobes, sushi or gift shops. 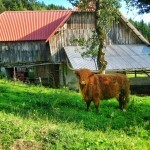 Here, deep in the mountains of Slovenia, you have Dixi and his family providing you with local flavor. 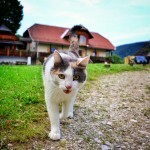 The real experience of life and recreation in Slovenia guides your time spent here. In this area, the small scattered clusters of farmhouses, don’t exactly make a town proper. Maybe a village if you’re lucky, but more often than not these are small family farms, two or three together, that have stood here for generations. Dixi and his team work together with these neighbors to gain access to roadways and the historic trails that have dotted this landscapes for hundreds of years. He employs locals to help provide food to guests, overflow lodging if needed, transport, guiding and any other manner of services. These are local people, using the resources at hand to share their love of the mountains, combined with Dixi’s zeal for bike tourism. 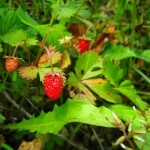 This is Slovenian style. Working together. Building locally. This is bike tourism growing the local economy. Stopping during a single track session to say hi to the nieghbors.